The feared telegram - "Deeply regret to inform you...". This form tells that Corporal Leonard Williamson was 'killed in action' on 13th November 1916 in France. This was the standard form sent by the British War Office to next of kin to notify them of the death of a member of the army. There were separate forms for notification that men were missing or wounded. Each Battalion in the British Army had a chaplain. 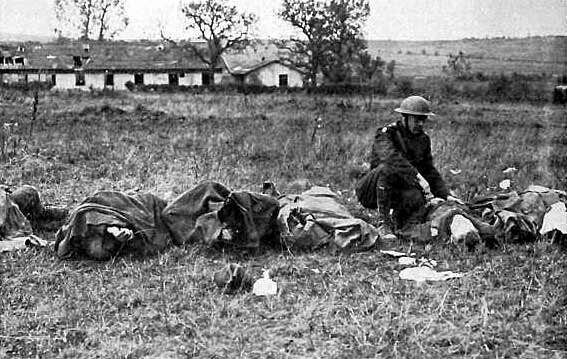 He had ‘the care of souls’ of the men in his battalion. Chaplains would minister to the spiritual needs of the soldiers and to the burial of the dead. They would also undertake practical tasks, such as writing letters for wounded men and to the next of kin of the soldiers who had been killed - see below. A letter to the sister of Corporal Williamson, who was 22 years old when he died in an attack on the village of Serre, on the Somme front. 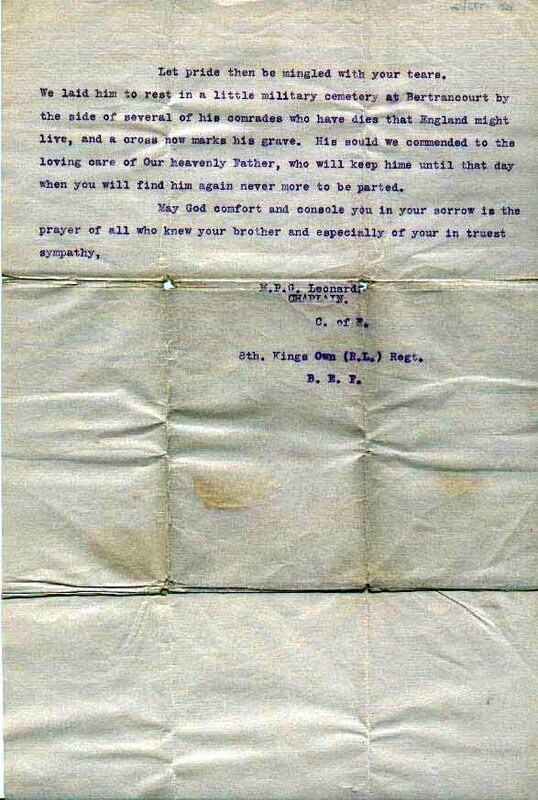 This letter was written by Chaplain M.P.G. Leonard. The corporal, who was from Manchester, had named his sister as his next of kin. Probably both of his parents were already dead. However, letters like this, detailing the circumstances of a soldier’s death, were often not directly addressed to the parents. At the beginning of the war chaplains were almost all Anglican. However, as the war continued the proportion of nonconformist & Roman Catholic clergy rose. ...and a cross now marks his place. War cemetery in France, 1918. Killed In Action, drawing by Kathe Kollwitz. Kathe Kollwitz lost her only son in the war.